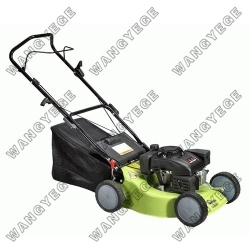 ● The chassis has excellent anti-vibration and anti-impact functions. ● Advanced U type shock reducer handle design makes the operator work easily. Press lightly and raise up the front tire, turn flexibly as you like. ● Big capacity nylon grass collector has the functions of cutting, breaking and collecting. ● The shell and tire of wheel is made by special plastic. The bearing is made by special steel with excellent performance, which can save your maintenance expenses. ● Specially designed blade and machine can greatly improve the cutting and collecting functions. ● The engines with 4 and 5.5 Horsepower created strong power. ● The brake system immediately stops the engine in order to avoid unexpected injure and assure your safety as soon as you loosen the operation handle. ● It's up to you to choose which kind knife as you like. Front Wheel 203mm / 8"
Rear Wheel 203mm / 8"